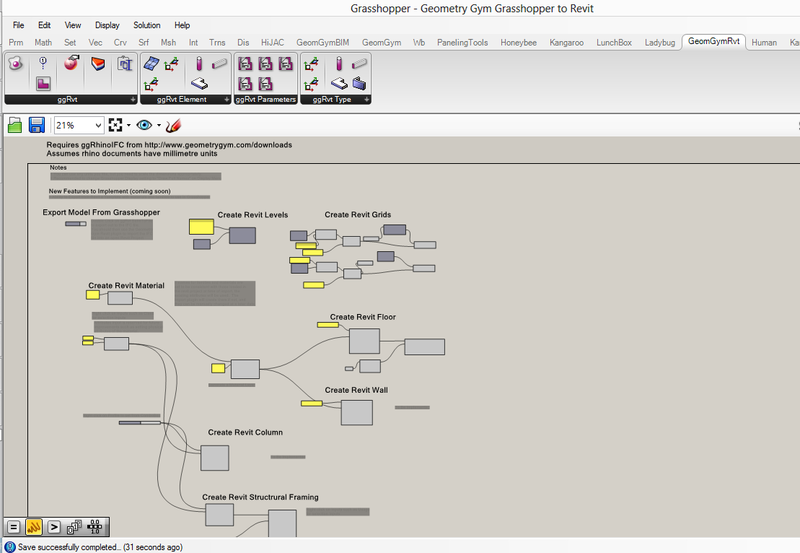 I've been asked many times about a manual for the Geometry Gym plugins, particularly Grasshopper to Revit. I've hesitated a few times. The plugins are still evolving fairly rapidly and I've been reluctant to spend time on something that might quickly be irrelevant. I also find this post by David quite relevant. And there's also the question about what format help documentation should be in and how it could be contributed to by a wider user group. My opinion has been that the best format for user guidance should be example scripts (which is why I've populated my blog with lots of short examples. But this can be hard to search and find, and maintaining lots of files takes some effort. I've recently been using Git (and in particular GitHub) more and more when working with others on projects (and for my own code management). So I'm going to try hosting an example script of the Grasshopper to Revit functionality there. If I save it as a .ghx (which is xml) that means it can be versioned and tracked, branched and a wider group of users can participate in it (even if it's just subscribing to updates). I do intend to also note upcoming features etc in the definitions. If you're not so familiar with GIT, then using the github windows application should make things much easier. Initially it's just Grasshopper to Revit, but I do plan to add other examples such as the various structural analysis software. I look forward to hearing feedback and suggestions from those that try it.